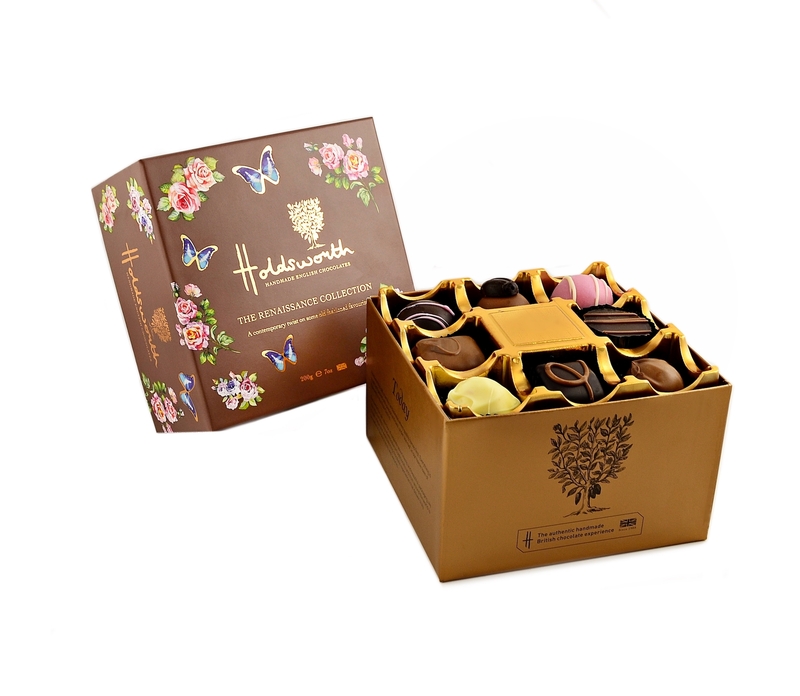 The Renaissance box gives you familiar flavours like orange cream, chocolate fudge, chewy toffee and many more. 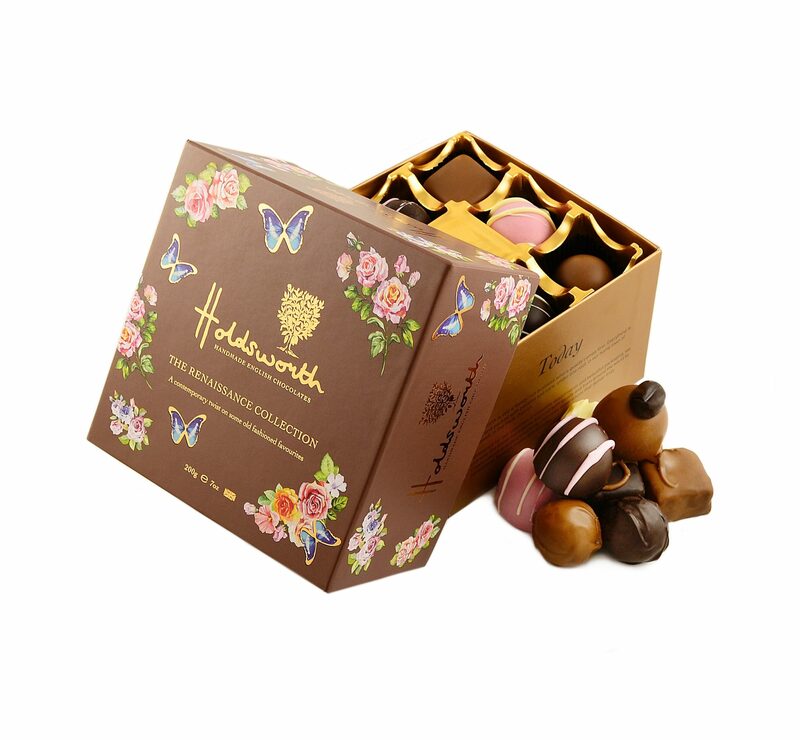 All enrobed in the finest chocolate – an ideal gift for someone special. This sized box also come in our Pink Theobroma Collection – Click to view. Ingredients: Dark Chocolate (Cocoa Mass, Sugar, Cocoa Butter, Emulsifier: Soya Lecithin, Natural Vanilla), Milk Chocolate (Sugar, Cocoa Butter, Whole Milk Powder, Cocoa Mass, Emulsifier: Soya Lecithin, Natural Vanilla), White Chocolate (Sugar, Cocoa Butter, Whole Milk Powder, Emulsifier: Soya Lecithin, Natural Vanilla), Butter (Milk), Fondant (Sugar, Glucose (Wheat), Water, Preservative: Sulphur Dioxide), Caramel (Glucose Syrup, Sweetened Condensed Skimmed Milk, Sugar, Water, Cocoa Butter, Modified Starch, Thickener: Agar, Flavours, Emulsifier: E471-Sunflower Lecithin, Salt, Acidity Regulator: Citric Acid, Preservative: Potassium Sorbate), Praline Paste (Sugar, Hazelnuts, Emulsifier: Soya Lecithin, Natural Vanilla), Marzipan (Sugar, Almonds, Glucose Syrup (Wheat), Invert Sugar Syrup, Preservatives E202, Humectants E420), Fudge (Sugar, Glucose Syrup, Sweetened Condensed Milk, Palm Oil, Butter (Milk), Emulsifier Soya Lecithin, Flavouring, Salt), Fruit Purees (Glucose Syrup (Wheat), Invert Sugar Syrup, Strawberries, Orange, Beetroot, Lemon & Raspberry Juice Concentrate, Natural Flavouring, Ethanol, Acidifier: Citric Acid, Colouring Plant Concentrates (Carrot, Pumpkin, Apple, Safflower, Lemon)), Toffee (Glucose Syrup, Sugar, Sweetened Condensed Milk, Vegetable Oil (Sustainable Palm Oil), Butter (Milk), Salt, Molasses, Emulsifier: E471, Flavourings), Alcohol (Neutral Spirit, Marc de Champagne, Creme de Cacao, Brandy, Orange Liqueur, Grand Marnier®), Puffed Rice 4% (Rice Flour, Sugar, Wheat Malt, Salt), Glace Cherries (Broken Cherries, Sucrose, Acidity Regulator: Citric Acid, Preservative: Potassium Sorbate, Sulphur Dioxide, Colouring: Erythrosine), Natural Flavouring: Lemon, Orange, Strawberry, Coffee, Almond, Brandy (Propylene Glycol), Strawberries, Raspberries, Coffee Granules, Salt Flakes, Colour (Beetroot), Citric Acid. Was given these as a gift for Christmas…they really are superb. Excellent quality. Thank you. Lovely product. 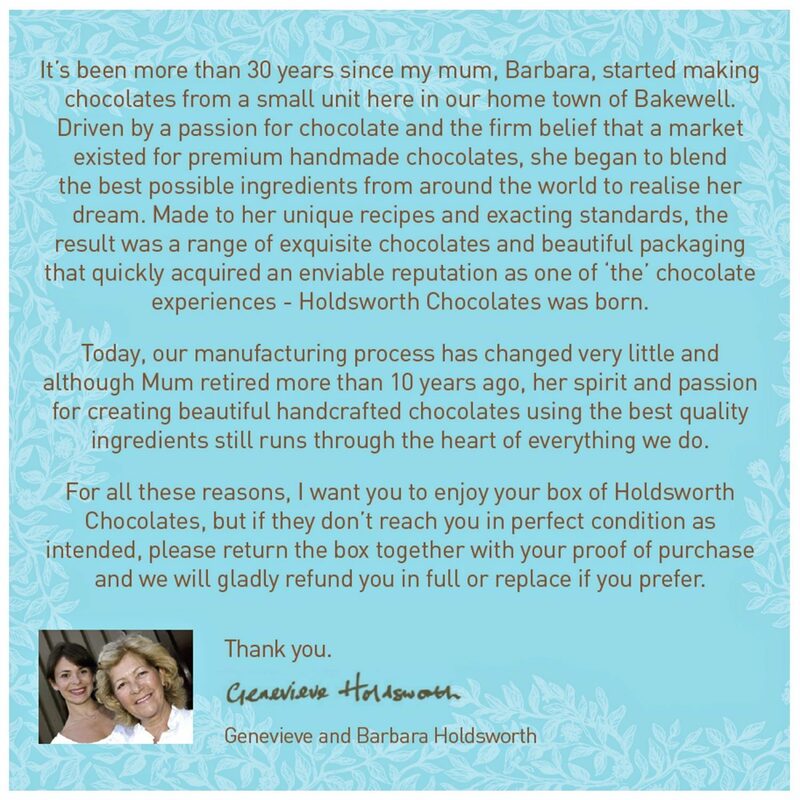 Thank you for taking the time to contact us with a such a great comment! We’re glad you enjoyed our chocolates, We are a small family business and it is very important to us that all our customers have the best experience possible when enjoying our chocolates. Thank you again for the lovely feedback. Received this lovely little box of chocolates from my grandaughter for Christmas and they are honestly the best chocolates I have ever tasted. Absolutely gorgeous. Will be ordering them when I need gifts for friends and family. 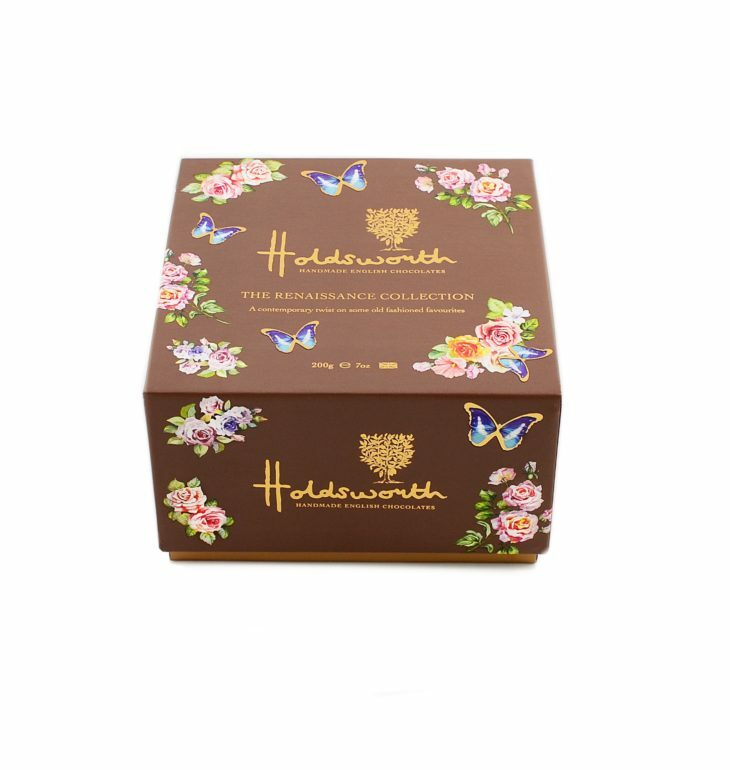 I love these chocolates – they were a gift for my birthday instead of some from Hotel Chocolat. They’re absolutely delicious. I will definitely be purchasing them again.